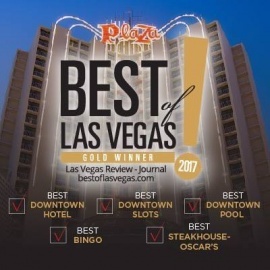 The Plaza Hotel and Casino redefines Downtown Las Vegas luxury and creates a perfect combination of comfort and sophistication. 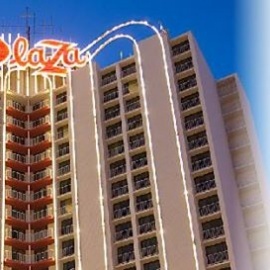 Anchoring the Fremont Street Experience, the Plaza has been an iconic hotel in Downtown Las Vegas for the past 40 years. Complete hotel and casino renovations in 2011 have updated and improved the Plaza’s ambience throughout, creating a stylish and exciting new experience for each guest. Our lobby features beautiful marble and inlaid mosaic tiles, sparking chandeliers and a plush front desk that matches the classic Las Vegas feel with a contemporary look. With over 1,000 spacious and fully renovated rooms and suites showcasing sweeping views of the glittering Las Vegas Strip and Downtown Las Vegas, world-class entertainment, a brand new casino floor offering an array of signature and classic gaming choices, a first-class steakhouse, and ten new restaurants and bars, the Plaza is a full service property that will create a memorable experience for each one of our guests.